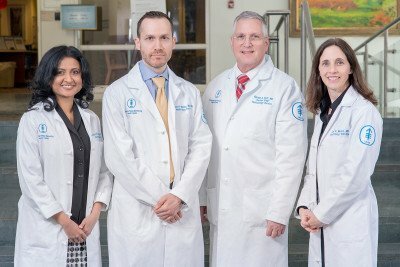 From left, hematologists Rekha Parameswaran, Simon Mantha, Gerald A. Soff, and Jodi V. Mones are experts in treating rare blood disorders. When the normal process of blood cell growth and development breaks down, certain cell types can be produced in abnormally large quantities or in abnormal form. This gives rise to blood cancers or other blood disorders. The most common blood cancers include leukemias, lymphomas, and multiple myeloma. There are less common blood disorders too. These include various myeloproliferative neoplasms, histiocytosis, and paroxysmal nocturnal hemoglobinuria.